Looking to stretch your livestock feed budget and to feed your animals the best possible? 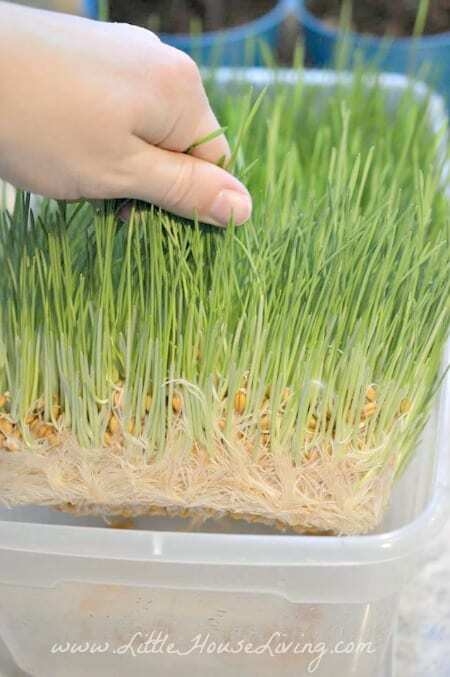 Learning to grow your own fodder can be very helpful! If you would have asked me a few months ago what the meaning of fodder was and what you do with it I wouldn’t have been able to help you. 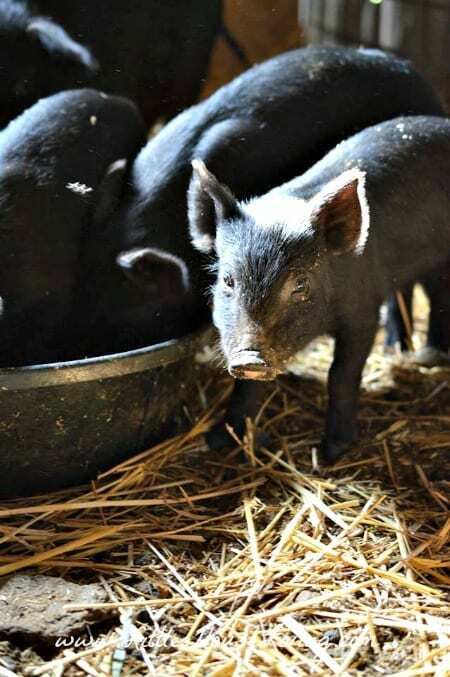 But, since adding heritage pigs to our little farmstead, I’ve learned quite a few things about fodder, sprouting, and what it means to have a foraging animal. In November we picked up a few little Mulefoot piglets to add to our farmstead. Mulefoot Pigs are a true heritage breed and are pretty rare. They aren’t as highly prized as a regular feeder pig because they are not a fan of grains which most pigs are now raised on. Mulefoot Pigs have retained the knowledge of foraging and they love being a true “pasture raised” pig. In the summer, forage plants will be easy to come by but now in the dead of winter with snow on the ground, there isn’t much available for our little pigs to munch on. So we’ve been working on coming up with healthy alternatives that our piggies will love. In addition to sprouting, I’ve been growing fodder for not only the pigs, but for all of our creatures; goats, donkey, and cows. Next winter we will also grow it for our chickens. 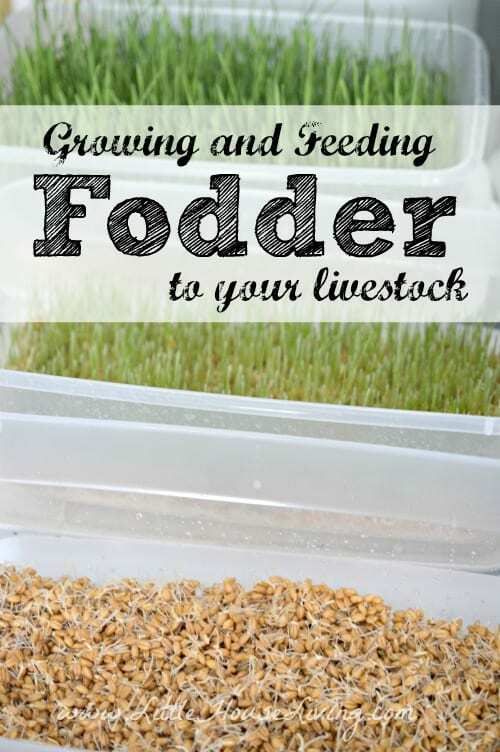 Fodder is a natural and highly digestible feed that you can grow for your animals and livestock. 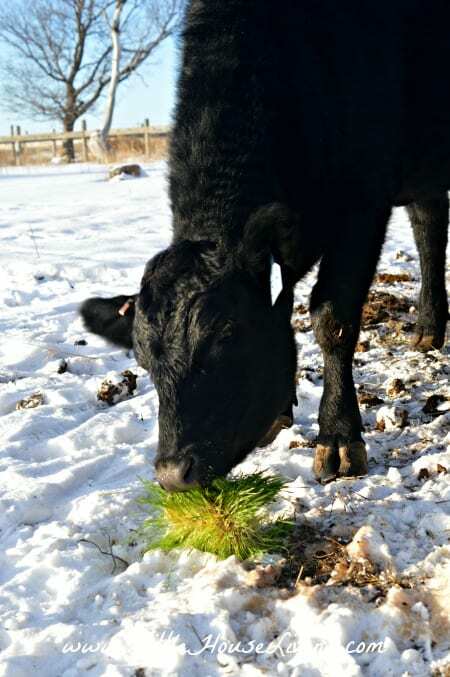 Although from a grain, fodder is “alive” and contains many more nutrients to keep your animals healthy. Where do you get fodder? You grow it! 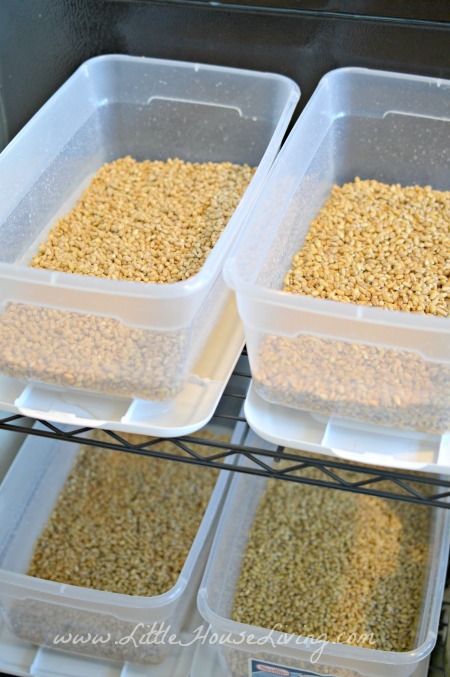 You will need a few different grains (barley being the most popular because of it’s nutrient value), some containers, and some kind of rinsing system. How much does fodder cost? Fodder is actually much more cost efficient than just buying grain. From one 50lb bag of grain I can get at least triple that weight in fodder. We pay $33 for 45lbs of non-gmo barley from Azure Standard, so for us it’s a great value for the money and our animals are getting a healthy plant to eat. Here’s how I put my system together. We simply took plastic shoe box sized totes and my hubby drilled small holes into the bottom of each one with a small drill bit. Then we placed each of the totes on the upside down lid to use it as a drip tray. I then placed these containers on a wire shelving unit in an area of our house that gets a good amount of sunlight and is fairly warm. Starting the fodder is simple! 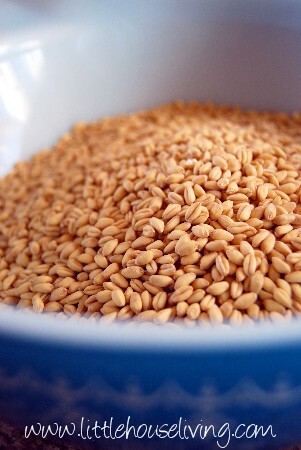 Take a quart sized jar and fill it with one cup of whatever grain you are using (the above pictured is wheat). Put a small splash of apple cider vinegar in the jar and fill it the rest of the way with warm water. Apple cider vinegar will help inhibit mold growth and warm water will help kick-start the sprouting. Place the jars in a spot where they won’t be disturbed for 12 to 24 hours. 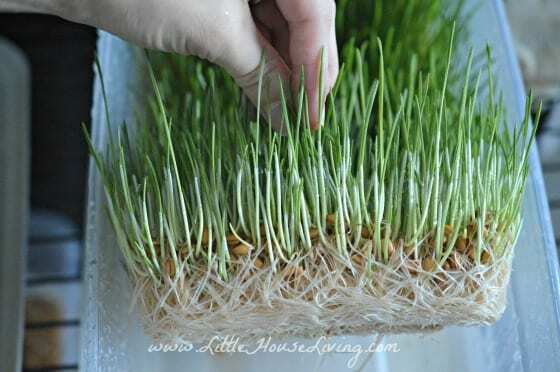 I use these Sprouting Jar lids for the tops of the jars to rinse and drain things I have sprouting. I was using cheesecloth, but it got pretty yucky after a while. 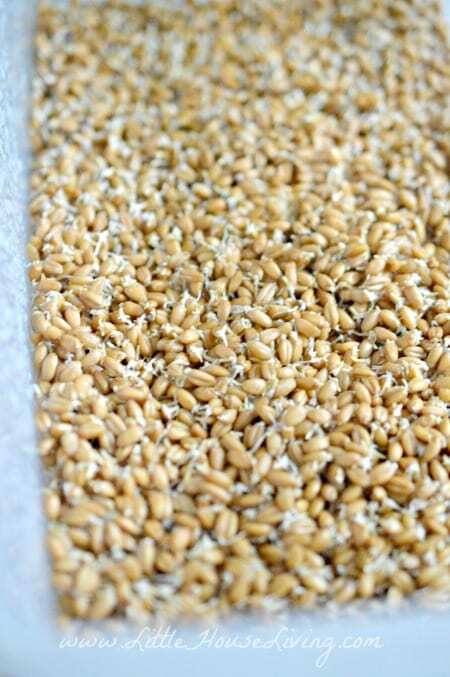 If you are using a very fresh grain you won’t need to sprout as long. After 24 hours, drain any remaining water and rinse the seeds. Place the seeds in the plastic storage totes in a flat layer. You can give them an extra day in the jars if you want to. Just be sure to rinse twice. 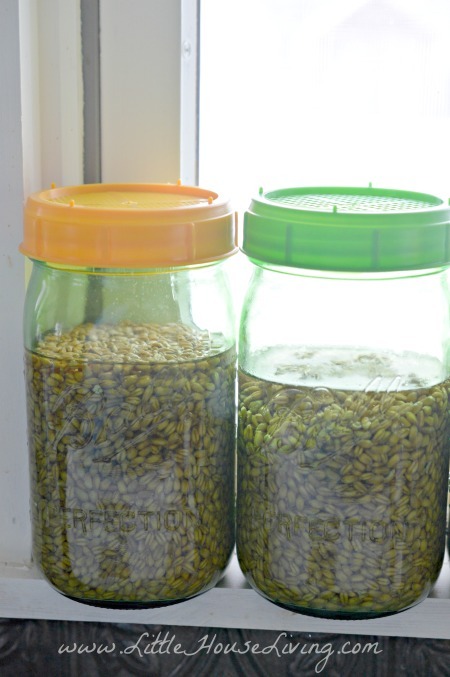 By the second day (at the latest) you will want to make sure your grain is in the containers. Spread it in a somewhat even layer and rinse twice a day. To rinse, I just take the container, place it in the sink and spray it over with my sink sprayer, then I gently shake off extra water and place it back on the lid (aka the drip tray). If your grain doesn’t seem moist enough you may need to rinse three times a day. By day three you should see some good little sprouts starting (p.s. I’ve found that if I keep my sprouts in the jar for at least two days, the sprouts are WAY bigger at this point). This is my wheat fodder by day four. The grass part isn’t super high yet but the roots are getting big. You will want to harvest by day six or seven or your fodder will start to lose its nutritional value. Depending on the type of animal you are feeding, you can either break up the fodder into pieces or simply toss it into their area and let them pick it apart! 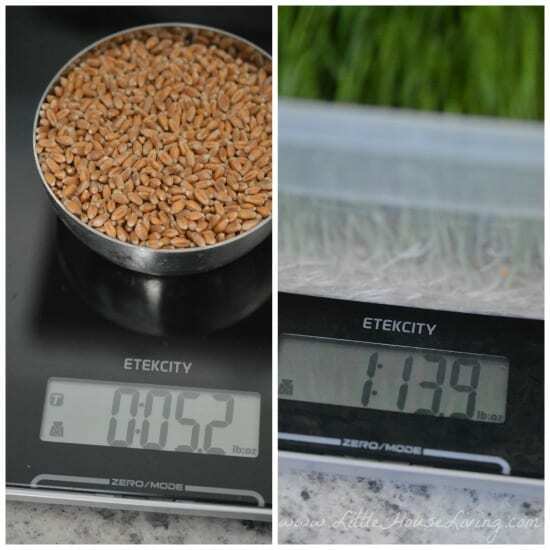 I thought it would be fun to do a comparison of the prices for the grain and the final fodder product. Of course we want to make sure our animals are healthy and getting good nutrition, but we also want to make sure we are getting the most for our money! 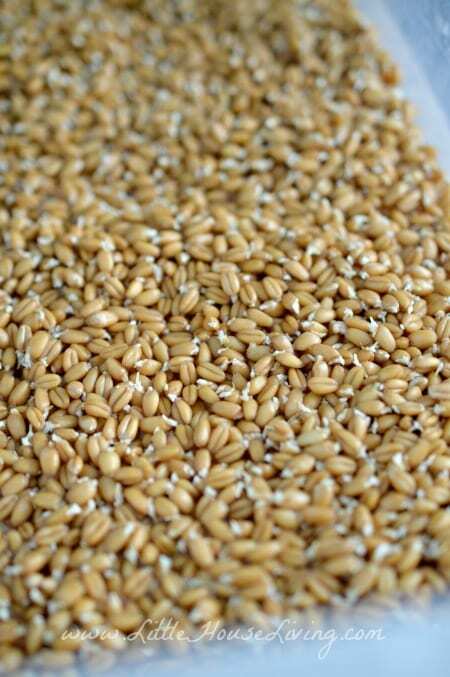 We use 1 cup of wheat or barley per container that we make into fodder. As you can see, instead of paying $0.55 per pound for just the grain, we actually end up paying less than $0.09 per pound for a much healthier and nutritious product! Maggie is enjoying her breakfast! 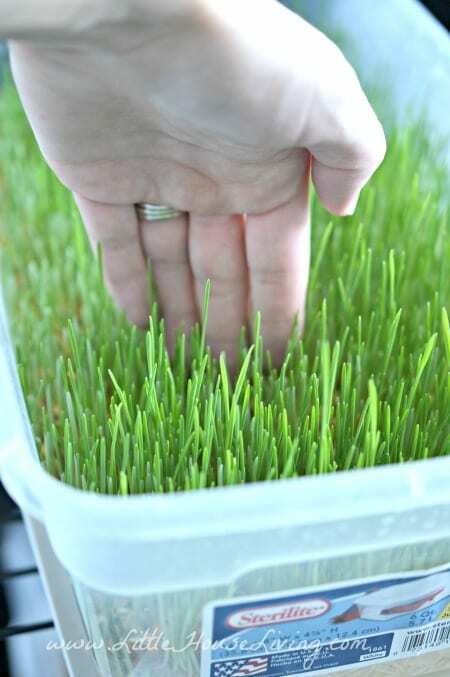 Have you ever tried growing fodder? What was your experience? What animals do you, or would you, feed it to? So beautiful and how excited the animalsist be to get greens in the winter! I love this and Azure Standard!!! 🙂 How many trays do you feed per day? I’m just thinking if each tray is in a seven day rotation and you need 5-6 trays per day….that’s over 40 trays at vary stages of growth…how do you accommodate that large of a space requirement? Thank you for taking the time to pit this post together….super informative! I have been watching several Youtube tutorials and reading blogs and we decided to try making fodder (barley). We are doing this in our garage and the trouble we are having is not all the grains are sprouting. Actually only a few. I am on my third try and still it is that way. We came up with a water system, this last try, that waters them automatically 3 times a day and I was very hopeful but when I went out this morning to check, only a few again. Could this be because of the humidity? (we live in Virginia) They are in front of the window. its cooler in the garage then outside so I just don’t know what to do. Any advise? Have you tried a different kind of seed to see if your seed is having issues? No, I have a 40lb bag…..can you tell me where you get yours from? I got ours from Azure Standard. Thank you so much for sharing! I would love to do this for our chickens, but we don’t have the space right now. I’m pinning this for future reference! This is great to read. Thanks! We have chickens but cannot let them roam because of the neighbors dogs, so Im guessing this would be a great idea for them! How much of this would you think we could replace their laying feed with? This would be great for them! It’s hard to say exactly how much feed it could replace but it’s worth trying on a small scale and seeing how it will work for you. We do this for our chickens. I feed them about a quarter lb each and they also get kitchen scraps. I start 1.5 cups each day to get the 2.5 lb I need. I also use the plastic shoe boxes but Ii drilled holes on one short end of the bottoms and placed them on wire shelves so they drain from one to the next and eventually out the bottom into a bin. I transitioned the chickens gradually, feeding half and half for a few weeks, so they could get used to it and they love it. I love the pics of the animals! Ingeniousbwithbraising the fodder!! So your little pigs are so cute are you keeping them for pets or to harvest? We do this but for our chickens…. Our garden is pretty much non existent in the winter so this is a great alternative. We grow fodder for our chickens. They love it, and it really saves a lot of money in the winter. We order the Whole Barley – Animal Feed 50lb bag. Thanks for the tutorial! I am going to try this for my chickens. They free range a lot in the summer, but winter here is long and they’re inside for a long time. Putting a big ole clump of fodder in their coop should keep them busy for the whole day. I love fodder. I saw that you put yours on a metal stand. One thing that you can do is put small holes in the bottom of your containers and zig zag them with pvc piping, lifting on end of the container. That way you only have to water the top containers and it becomes kinda self-watering. Just make sure to place an empty container with no holes on the bottom to catch excess water. My local feed store orders winter barley in for me. Much cheaper than ordering online. We grow fodder for our chickens in the winter. We have tried barley and millet in the past. Although the chickens seem to prefer the millet fodder, it stinks so bad when it’s growing AND the seeds are so small you have to use a cheese cloth under the seeds so they don’t rinse out through the holes. I’m going to try a combo of both seeds next and see what happens! We are also looking into getting AGHogs in the spring and will need forage food as well. Have you tried wheat? I’ve been working with barley lately and I can hardly stand the smell in the kitchen (where I have my fodder set up), I may have to wait with that until I can put it in a different room. Wow! We raise pigs every summer. I love them (most of the time). you’ll love having all that lard! I’ve never grown fodder. Thanks for the great info! I’m really looking forward to the lard! What do you do with yours? Ive been looking into this for our dairy cow in the winter. I was told by another dairy farmer that it can be eaten just like grass. Does it just replace the grain portion of the cows diet? Can it reduce the hay portion as well? We’re trying to be as self sustaining as possible, and also reduce costs where possible. Thanks for taking the time to always share such wonderful info with us. Ps I’m eating that fabulous coffee cake right now!!! 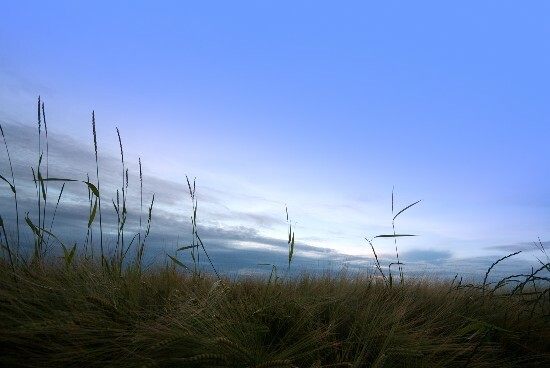 It cannot replace hay because the cows need the fiber and roughage in their diet. It’s not considered feeding grain as the final product is not longer a dead grain but a living plant. We use it as a supplement to our hay feeding with our cows. Promise not to chuckle…. could you use this process to sprout grain/seeds for human compsumption? 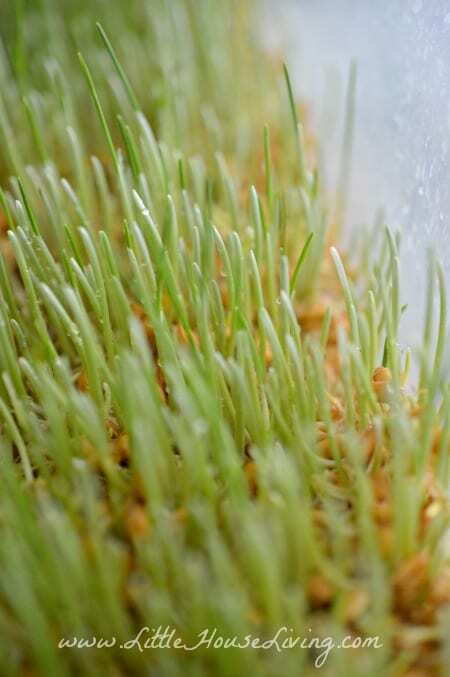 At least with the wheat you are basically growing wheatgrass so I don’t really see why not. I’m not sure about the other grains. Something to look into more for sure! I actually use the same container, ….But I use 2 of them…the one that has the drain holes and the seeds– and another one for it to sit into for soaking, draining and tilting up to get light. after I soak them over night, and then drain off the bottom container, I then tilt the top container upon one end, still inside the bottom container and it continues to drain but also catchs light from the window. That is so great about the mule foots. I was wondering if you got them from Ari McFarland. We sold her our Guinea hogs when we moved off our farm in Astoria, before she got into the mulefoots. She has done a wonderful job for the heritage breeds. You and the kids will love them. I’m not sure Hollie, my husband picked them up for us. I believe they were from the Valley Springs area? We really like them so far, they are fun! I haven’t tried fodder yet, but think I will. This was great, thanks! I do sprouts for our family, and what I use for the tops of jar lids is plastic canvas. It’s easily cut. 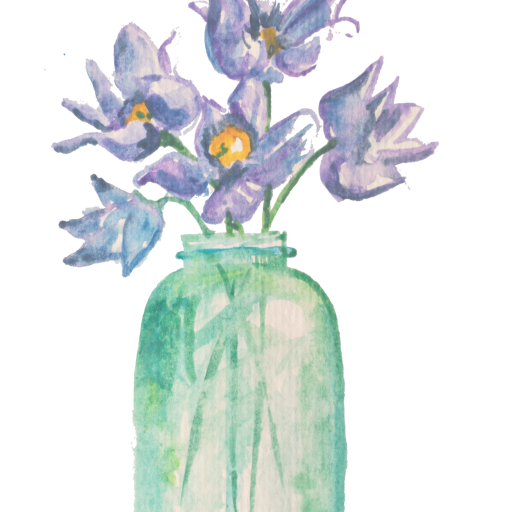 I found a small piece (maybe 5″x7″?) in some craft stuff I was given, and held up a jar lid to cut around. I got 5 or 6, and just put one on the jars with a canning ring. They go through the dishwasher just fine. I have really been wanting to do this, but I have one problem – since we use only wood heat, the house can get pretty chilly at night. How cold can this get and still grow? I haven’t tested so I’m not totally sure but I know our kitchen gets cool at night (which is where I have mine right now). I think as long as it is warm during the day and it gets watered often (that’s the most important part) it should be fine. It just may take an extra day or two to get to it’s full potential. I started up some fodder again and I’m so glad your post kicked me in the but to get this moving along. My chickens will be so happy. Also, we are getting a heritage breed of hogs in the spring and I was wondering if you have any recommendations for books on raising heritage breeds? I can’t seem to find any. Thanks! We haven’t read any yet and so far have just been getting advice from others that are raising hogs. If the barley is whole it will sprout, I’m not sure about rolled barley, I haven’t seen that one yet! Thank you for sharing! We just started using the fodder system for my milk goats. We are keeping it all in the house but it seems to have a”bad” smell. The water is very brown in color, we have gotten to where we are changing the water twice a week. Have you had this happen? We are also using wheat. There are days that all the grain sprouts and other days there are a lot of seeds still at the bottom of the tray. The trays that sprout nicely smell sweet but the trays that don’t have an off smell to them. We started out soaking 24 hours and rinsing a couple of times. We are now just soaking 12 hours. I would like to keep it in the house but I’m not looking the odor. What do you mean by changing out the water twice a week? We rinse our fodder twice a day and the water does not remain in with the fodder, it drips out of the bottom. I also wash out my trays with soap and water after we are done with a batch and moving on to another. I am trying to go to a fodder system for my rabbits. I am moving to colony raising them, which means that grain will just get soggy when it rains. This seemed like the perfect solution. However, my grain simply won’t sprout. I have done everything listed in the fodder directions and nothing. The only thing I’m getting from my seeds are flies after three days. What am I doing wrong? What kind of seed are you using? My chickens love sprouted wheat. keeps them happy during the clod snowy winter months. Fodder alone is not enough of a feed for pigs since they need some kind of higher protein (and fat) source as well. What do you supplement with the fodder for your pigs to ensure they get all the remaining nutrients they need? Our pigs are still fed a high protein feed that we have custom mixed at the local mill. What other grains do you use for fodder when feeding your pigs? I mostly used wheat because it was the easiest and cheapest to grow. I tried barley which was kind of smelly and more difficult to grow and field peas which are easy to grow but more expensive. How many holes did you put in the bottom of your box/trays and where do you put the holes…and how big are the holes?